Cardiomyopathy is a result of change in the structure and function of heart muscle cells. These changes cause the heart to not function properly and can lead to heart failure, which is when the heart cannot pump blood as well to other major organs. This can cause a back-up of fluid in the body, leading to fatigue, weakness and potentially deadly heart rhythms. There are many different causes of cardiomyopathy, ranging from genetic mutations, certain viral illnesses or as a consequence of chronic medical issues like high blood pressure and coronary artery disease. There is a range of changes that the heart can undergo, such as thickening of the heart muscle (hypertrophic cardiomyopathy), thinning of the heart muscle (dilated cardiomyopathy) or an inability of the heart to fill with blood (restrictive cardiomyopathy). Patients will typically present with increased shortness of breath with activities, chest pain, swelling in the legs or after passing out unexpectedly. Athletes can also express increased fatigue or a decrease in performance as one of the first symptoms when developing heart failure, which may be initially attributed to aging or over-training. Initial evaluation will include a thorough history and physical, including reviewing a family history, asking about possible symptoms, measuring blood pressure and listening for heart murmurs. If the physician is concerned for an underlying cardiomyopathy or heart failure, several tests will be obtained, including an electrocardiogram (ECG), a chest x-ray, blood tests looking at electrolyte levels and kidney function and an echocardiogram (an ultrasound of the heart). Additional testing may include a Holter monitor to look for abnormal rhythms, cardiopulmonary testing to assess your heart and lung function and a cardiac MRI. Treatments for cardiomyopathy include medications to improve blood pressure, increase heart function and decrease swelling. Close monitoring of salt and fluid intake is needed to prevent worsening of symptoms. If your heart is functioning poorly, a defibrillator may be placed to shock potential life-threatening irregular rhythms, as well as consideration of heart surgery or a transplant in severe cases. A pre-participation physical exam (PPE) that includes a review of symptoms, family history and consideration of special tests, such as ECG, can help screen for several types of cardiomyopathy. In younger athletes diagnosed with a cardiomyopathy, activity modification and close follow-up with a heart specialist with individualized recommendations can help prevent problems. For older athletes, the main prevention of heart failure is control of underlying, chronic conditions such as diabetes, high cholesterol and high blood pressure. Lifestyle changes, including eating a healthy diet, prescribed exercises and limiting salt intake can be helpful. Athletes with hypertrophic or dilated cardiomyopathy are typically excluded from athletic participation, excluding low intensity activities such as golf or yoga. This is due to an increased risk for having sudden death from a heart attack or irregular heart rhythm with exercise. Athletes with an acquired cardiomyopathy, such as from a virus, are withheld from sports and closely monitored until their symptoms have improved and the function of their heart has returned to normal. Maron B, Udelson J, Bonow R, et al. 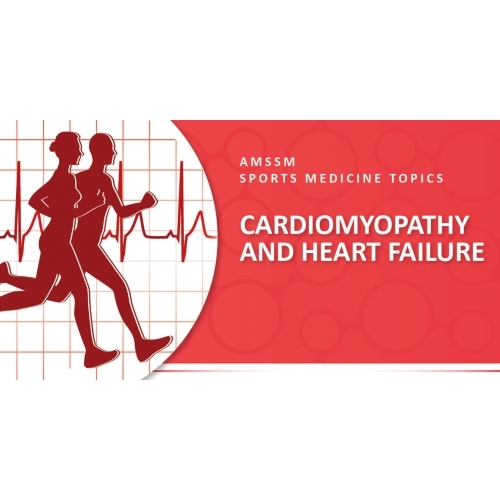 Eligibility and disqualification recommendations for competitive athletes with cardiovascular abnormalities: Task Force 3: Hypertrophic cardiomyopathy, arrhythmogenic right ventricular cardiomyopathy and other cardiomyopathies, and myocarditis. A scientific statement from the American Heart Association and American College of Cardiology. J Am Coll Cardiol. 2015;66(21):2362-2371.